It is an open and guilty secret of the profession that much of its lauded and awarded architecture takes shape, to some extent, in a reality bubble. Privileged by topography, budget, client, or high cultural purpose (and occasionally, all of the above) these projects are often sheltered from the full enervating force of commercial property development, where the privileges of yield, market, cost and risk are all powerful. Indeed, it has become a commonplace to accept this divide, such that the profession’s output exists iconically in the heart of the city, yet economically and politically subsists in the hinterland of urban concern – enchanting weeds sprouting from the cracks of a dominant homogenised property business. I will not rehearse once again the future implications for practice of increased project novation and D&C “efficiencies”, which have been widely discussed elsewhere. Suffice it to say that reality bubbles are thin on the ground in these straitened times. The black art of property development is nothing new to the practice of Donovan Hill, which has built a solid career in walking the tightrope of design ambition and pragmatic problem solving. For although celebrated projects such as C House have benefited from highly committed (and occasionally patient) clients, many of Donovan Hill’s residential projects as well as more recent commercial and institutional projects have been challenged by a particular Queensland development and planning environment, which in latter years has been cursed by boom speculation. Clearly, rampant capital appreciation and a galloping market make good design less valuable to the developer than the maximising of net lettable space, full stop. What is remarkable then, is the Houdini flare with which this practice consistently wrestles quality outcomes from the depredations of a thousand and one cost benefit analysis calculations. 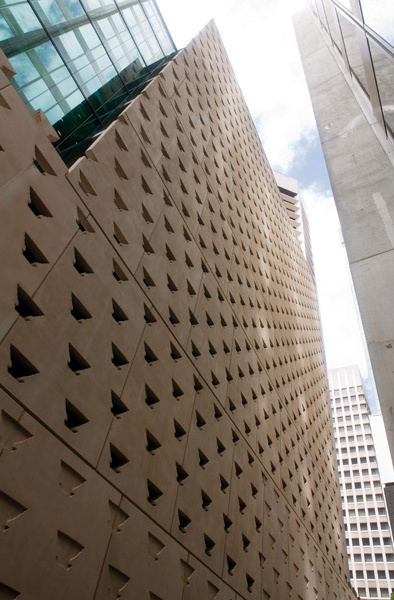 Their most recent urban intervention, The Chambers, came with a number of unique challenges including a rigorous conservation management plan for one of the city’s great heritage sites, a problematically small commercial floor-plate on a CBD site, dwarfed by corporate slabs that occluded views to just about anywhere but the street. On top of this, of course the more staple constraints of construction cost etc prevailed. 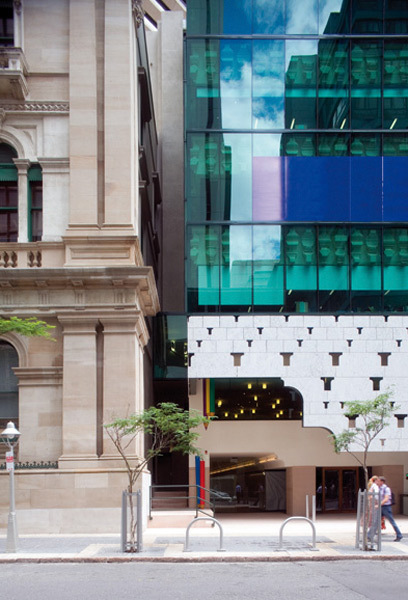 On the positive side, the original bank building, now a premium NAB retail space, presented itself as a treasure chest of architectural quotations and references. Originally designed in 1885, in Italianate Revival style by former Colonial Architect FDG Stanley, it started life as the Queensland National Bank. It was born into a time of exuberant optimism (not unlike the 1990s) with gold-rush population explosions as common as quarry blasts. But as we are all too painfully aware today, busts follow booms, and in 1891 a nationwide financial crisis led to the bank undergoing extended hard times. During this time the building suffered its first bout of weather damage and neglect. Since then decades of sub-tropical heat and damp along with cheap extensions and poor maintenance have taken significant chunks out of this old dowager’s pride. Not that other renovations along the way have been without value. There was extensive work carried out in the early 1920s by the Sydney architect John Kirkpatrick, including the replacement of the central dome with a dual-skin glazed lantern, new pressed-metal ceilings and a modest extension to the north-western edge of the site. In 2002 Riddel Architecture was engaged by NAB to undertake a conservation management plan and to investigate the redevelopment potential of the site. Banking practices had understandably evolved since the 19th century and could now easily be housed in a small retail tenancy. The 1920s extension was deemed less significant than the original FDG Stanley building and a high-rise tower was proposed in its place. This scenario provided a means of ensuring the commercial viability of the building in light of its sale for adaptive reuse. 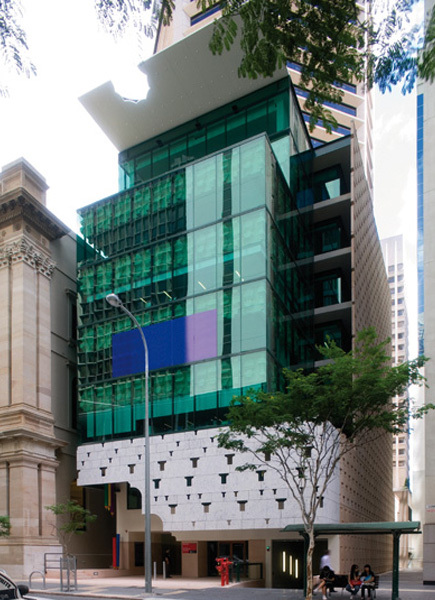 Brisbane developer Consolidated Properties acquired the former bank in late 2002, subsequently appointing both Donovan Hill and Riddel Architecture to prepare a development application. The new high-rise tower was to become a life support system for the old bank. Large obsolete mechanical plant was stripped out of the original, replaced by new plant on the top floor of the new tower, servicing both buildings. A shared service core provided other essential services to both, including twin lifts, complicated by split-levels caused by the shift in floor-to-floor heights from old to new. Options were considered to transform the new tower into a boutique hotel, reception facilities, apartments and offices. A development approval was obtained initially for a residential tower much higher than was built. As a result of mercurial market forces and circumstantial constraint a smaller commercial tower was decided upon, while air rights above were sold to a neighbouring building desirous of preserving its views. To build an office on this site was a bold move for the developers. It has become difficult to lease commercial tenancies of less that 1000sqm per floor, in a city where aggregated property blocks and poor planning have resulted in dozens of obese light-locked towers packed with cheap rentals. These buildings have in turn reduced parts of downtown into a corporate blandscape of working gulags. Doubtless the tower’s unusually small floor-plate placed pressure on the architects to create something beyond the commercial average. One of the key design elements of the project involved the adaptation of a number of the original building’s classical decorative elements. Punctuations in the suspended marble wall of the façade have been based upon the profile of a Doric capital taken from the existing building. On the north-western elevation, which faces onto a narrow laneway, these punctuations mutate into another quotation, this time taken from an interior classical detail. 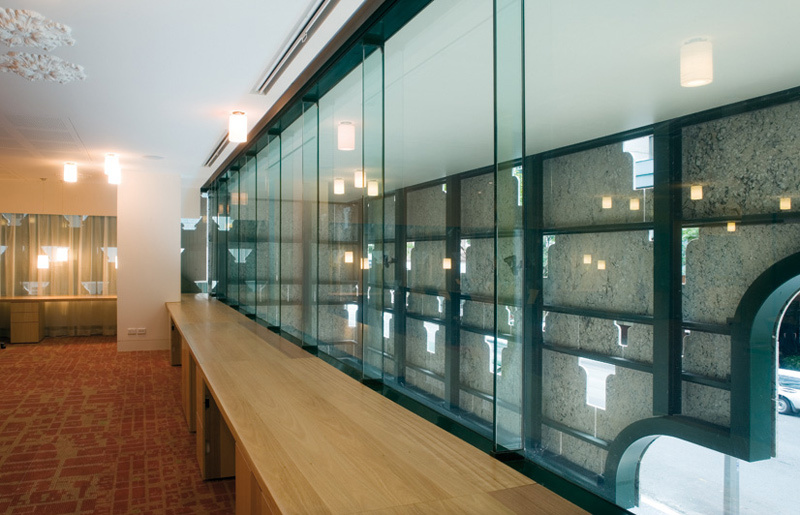 The wall itself became in effect a second skin, with a glass internal wall running behind it. This double wall not only bought the client an extra metre and a half of floor plate (which would otherwise be narrower due to fire regulations) but also created setback apertures front and back, which pulled views of the street further into the office plan. Typical of Donovan Hill’s other work, a creative manipulation of plan allowed the compression of the interior space to release onto the public space of the exterior. Now largely occupied, most floors have partitioned offices lined along the north-west length of the floor plate, with the remaining space open-plan. On each floor, a long interstitial space linking the services core and the office is defined by a dark ceiling and floor, while long deep shelving creates a buffer between the building’s nominally public circulation spaces and each private tenancy. 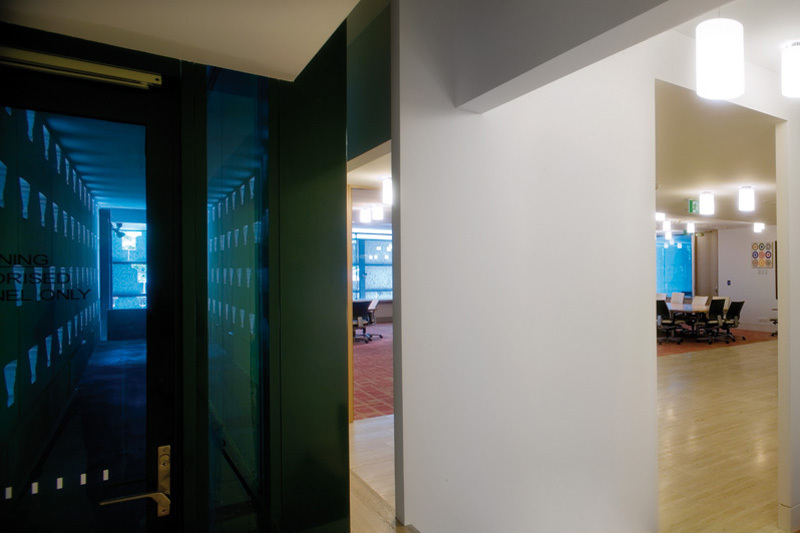 The first floor level, occupied by the building’s developers, contains a series of offices as well as a large boardroom. Convention dictates that corporate boardrooms reside up top where the air is thinner. That this symbolically removes the space of important decisions from the space of the public is not co-incidental. Here, in contrast, the boardroom consciously links to the street thanks to a curved cut-out in the hanging marble screen. Not unlike the manner in which D House conjoined the domestic space of the house with the public space of the street, The Chambers brings the life of the street directly into the space of work life. It also reveals the activity within, to the public. The capital motif used on the façade allows Queensland’s sharp sunlight to penetrate the interior space of this boardroom in subtle and mutable ways. This capital motif follows through to the modifications to the original building, where small working ‘pods’ are inserted into the banks voluminous existing office interiors. Each pod is adorned with the motif repeated across its painted timber surfaces. The rest of the interior, including its primary circulation, has been lightly refurbished, adhering to the conservation credo of doing “as much as necessary and as little as possible”. In the height and setback of the new tower in relation to the old, again there is deference to the conservation ethos of the project. The new tower is setback from the bank’s street alignment, to allow the old building to be laterally visible down the street. At the rear the new tower protrudes slightly beyond the footprint of the old building. This massing design decision allows a valuable view to open up at the rear, overlooking a modest civic space that has been redesigned to promote laneway activation. 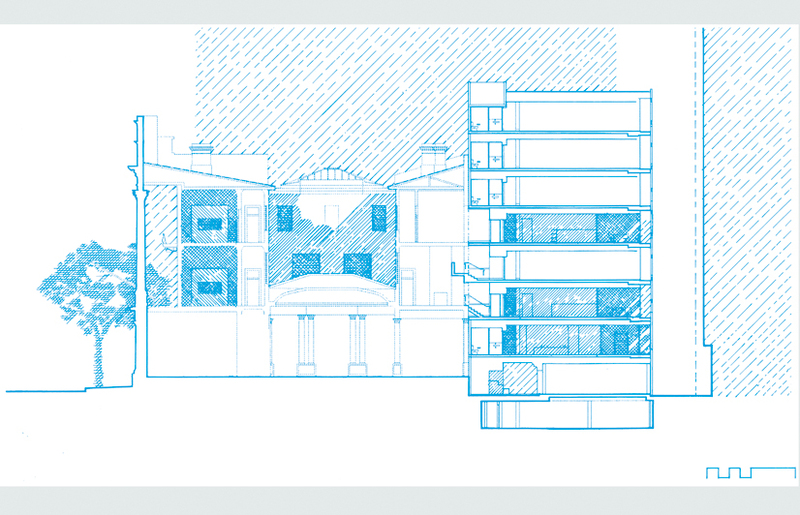 It is a small tweak to the plan, almost domestic in scale, yet its adds exponentially to the project’s spatial richness. As mentioned, the consolidation of small blocks into mega-blocks has created a blighted ground-plane in many parts of Brisbane. Here an opportunity was seized to exploit an existing easement around the building to increase pedestrian traffic. Outside spaces have been designed to allow future café use and to accommodate a formalising of what is currently that space’s informal use as smoko spot. It is the architects’ contention that neither city officials nor commercial landowners have shown the slightest care for the public use of such residual ground level spaces. More commonly such spaces are abandoned as beyond either commercial or civic interest. 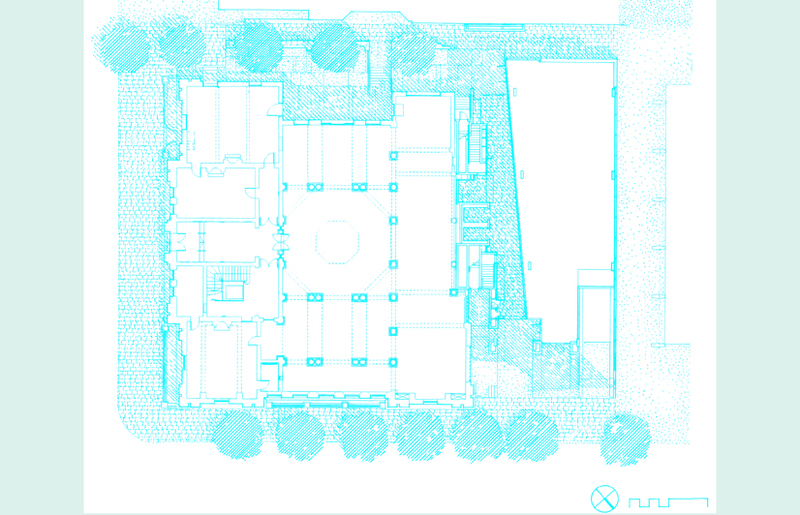 Time will tell if the opportunity seeded in this design bears fruit at the level of laneway activation. On the scale of urban design however, The Chambers unquestionably presents another successful balancing act from this practice. 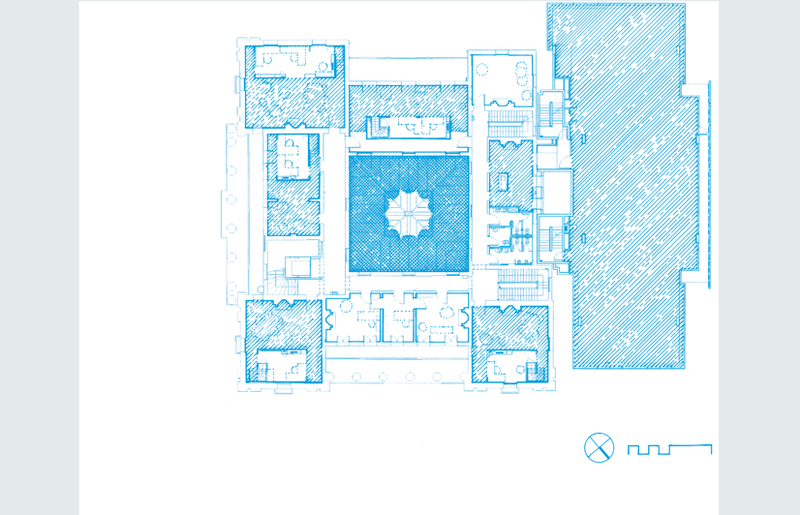 The conservation plan has been respected, and the collaboration between Donovan Hill and Riddel Architecture has been constructive and collaborative. The client is happy with a development that has commercialised a complex heritage site, while remaining adaptable to different use over time. Finally, importantly, the pedestrian is happy, with a new building that is generous with its space, and which rejects the mean civic spirit of its blank hulking neighbours.